In an evening concert held in our Parish Church on Tuesday the 22nd of December at 7.00 pm, the children’s choir Regina Angelorum sung various beautiful Christmas carols. 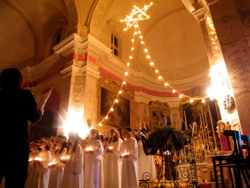 They learned these carols under the instruction of Mrs. Maria Cefai and Mrs. Jacqueline Vella. The choir also sang many popular songs related to the Christmas festival and also other songs with which the choir has now become synonymous. A good number of people attended the concert and everybody had words of praise for the sense of harmony and perfection that characterized the evening. Mr. Franco Cefai, the resident organist of our parish accompanied on the organ. At the end of the concert, the Archpriest Can. Reuben Micallef thanked the choir and expressed his congratulations. Mrs. Maria Cefai and Mrs. Jacqueline Vella were presented with gifts of appreciation for the occasion.